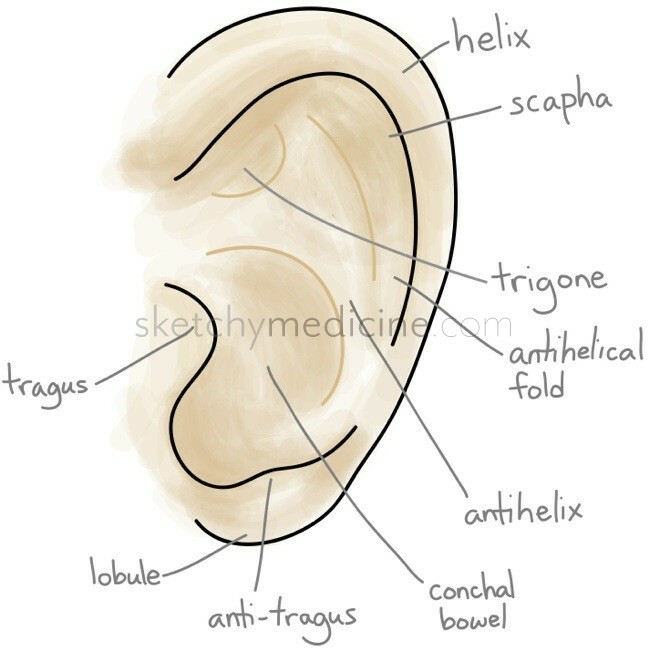 This entry was posted in Anatomy, ENT, Plastics and tagged congenital, ear, face by Ali. Bookmark the permalink. can you please make an illustration/sketch of mouth especially teeth pleaaaaase!!!!!!!! I had been meaning to do one about that for a while! It’s now up! can you do sketchy’s of the basic maneuvers in the sports med exam of the knee, hip, shoulder, wrist and elbow (mcmurray, lachman, ober, faber, drawer tests, catch up clunk, DRUJ etc etc etc?) desperate sports med board takers would be most appreciative!! That’s a great idea! I will try to do at least some of them! Which do you think would be the most beneficial? I think the Knee and Shoulder are the most complicated in terms of trying to diagnose patholgy in the office via phys exam. The sports medicine “special tests” for the knee (to help distinguish w/o radiology) are to differentiate meniscal tear vs ligament injury vs intraarticular pathology vs bony pathology (patellar fracture) and gout.— some examples are Lachmans, Macmurray, Apley, anterior and posterior drawer, pivot shift, grind tests, straight leg raiseAND valgus and varus (how the heck anyone can keep valgus and varus straight is s mystery). For the shoulder you already have some awesome ones like the Scapular Lift Off, and SITS (rotator cuff). But do you have the Hawkins, Kennedy, Beer etc tests?